New Work investigated communities, identity, and self-reflection of youth. 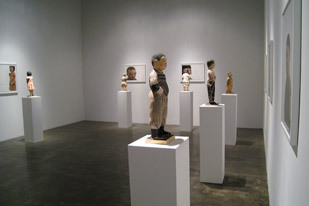 Exhibited at Frank Lloyd Gallery, seven figures of young students sit casually with their legs hanging off the pedestals. They appear to be gazing out towards the world while also reflecting inwards. Along the walls smaller figures face digital photographs of their own portraits. This presents a sense of seeing whole forms at once, at the same time.